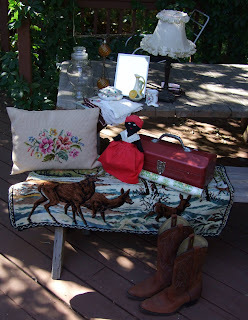 Little lamp with vintage shade, mirror, vase with yellow rose, little pink rose vase, vintage hair receiver, 6 vintage hankies, brass and glass towel holder, jar, needlepoint pillow, two sided doll (one side black the other white), red tackle box, vintage baby wrapping paper, deer rug and my favorite of all, cowboy boots for me! By now you probably think I have pretty ecclectic tastes in what I buy, and I do. I am never really looking for anything specifically, just what appeals to me visually or if I have had good luck selling a particular item in the past, I will buy that item again. Of course I do tend to gravitate towards things with roses. 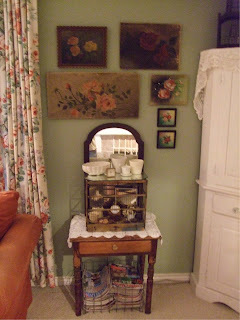 We used lots of mirrors and frames, creamers, little roses paintings and my new lamp. I love it! I wish I took a before picture of it, but I forgot. You can't really tell by the picture, but it is a very large mantle on top of a corner gas fire place which we never use. In fact, when we first moved here I hated it as I felt it took up too much space in the living room, now that it is all decorated, I really sort of like it. We worked our way around the room counterclockwise and next focused on this area. I think it is really very sweet and not too cluttered. Hey, I just noticed that you can see both of my "surprises" from my previous post (the white mirror and rose water color). Here is the next area with my tv cabinet. I looked for a long time to find this one. I love it! It is a corner cabinet as I needed one to balance the corner fireplace and since the room is not really that big. 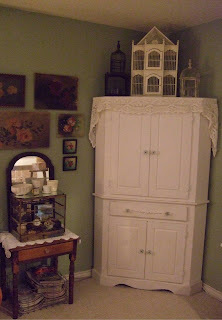 It was already painted white and I just added the rose applique and glass knobs. 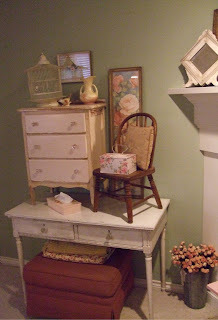 I found this little table with the drawer in my cluttered front room and decided it would be perfect here since I had so much white furniture I wanted to mix it up with a little rustic item. It is the perfect size to hold this vintage birdhouse I bought at an auction last spring. The mirror behind it was another one I bought awhile back and wasn't really using. We then rearranged the rose paintings on the wall above. The curtains I notice are a little messed up. I love these curtains, they are Martha Stewart from Kmart I bought them 6 years ago and still love them. I think I need to go through and weed out some magazines a little. Kind of messy looking, but the perfect spot to store/display them, don't you think? 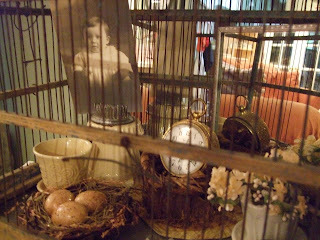 Decorating the inside of the bird cage was so much fun. It came together pretty quickly too. I have more pictures to share, just too tired right now. Gotta go to bed. Will post the rest tomorrow. Nighty night! I'm glad you came to the party, thanks for being a part of it. I love what you have done since then, too! Can't wait to see your cool holiday stuff at the next party! Your living room looks wonderful. I especially like the cabinet. The use of the pink pottery with the couples figures was very clever. Your green wall paint looks just like the green I have. I love what a neutral color it is! would have thought of that? You did, that's who!!! 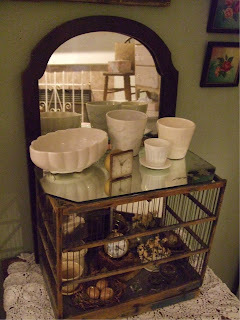 I once decorated an empty aquarium as a doll's house, but now this birdcage is too cute! What I love about my home! Do I have time for a Nap? Isabel's House aka Eye Candy!